Can you believe Labor Day weekend is upon us? Where has this summer gone? Well, if you are like me, you have a million projects that you said you wanted to get done this summer and somehow you closed your eyes one night to go to sleep and when you woke up, summer was over. Fall is always a great time to take a fresh look at your home and make some of those changed you wanted to get done this summer. So piece of furniture that you wanted to do something with and never got around to, now is the time! Won't you please join us, this Saturday, September 1st from 11-3pm at Main Street Shoppes for our Labor Day Sale and Paint Demo featuring CeCe Caldwell's Chalk & Clay Paints. These paints are 100% Green, No VOC's, No odor and completely non-toxic. Plus, this paint requires no prep work...yes I said, no prep work. No Sanding! No Priming! See the paint in action, ask questions and learn how to turn your tired piece of furniture into a show stopper! I will be there painting away! 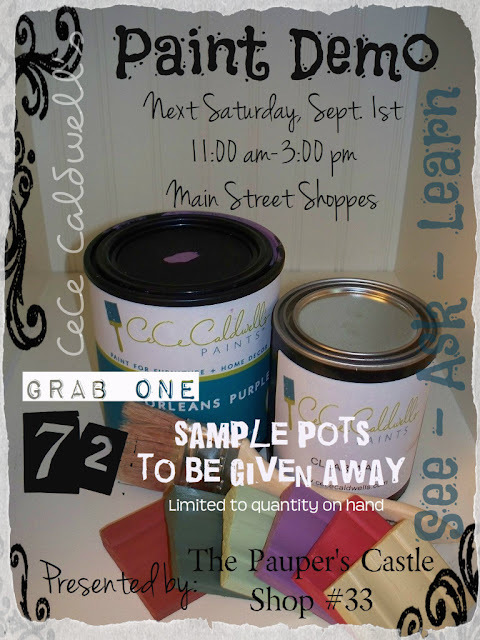 I will also have 72 sample size pots of paint to give out! Once they are gone, they are gone. So come early. While you are there....browse around. Main Street Shoppes is featuring their Labor Day Sale. Merchants are offering discounts from 10% - 50%. Great time to grab some new decorator items to spruce up your place. It's the first day of the sale, so selection should be good! It seems these days, everything I do is always for someone else. Especially when it comes to painting furniture. I have a list a mile long of project in my home that I want to get to, but somehow that never seems to happen. Well last weekend, I finally got my hands on a chair that I purchased at the Goodwill well before Christmas of 2011. I has been sitting in my living room with it's gold paint screaming at me for months...not mention the hideous fabric. I had purchased a vintage feed sack from another merchant at the mall we are in a while back. I knew I wanted to use it to recover this chair. So all I needed to do was to decide what color to paint it. I decided I would base coat the entire chair in CeCe Caldwell's Vermont Slate. Texas Prairie and Michigan Pine. Then I lightly distressed it to reveal the Vermont Slate. I sealed the chair with CeCe Caldwell's Satin Finish. It has the same look and feel as wax, but much more durable. Which for me seemed perfect. Plus you don't have to buff...which some days, I really hate doing. This was one of those days. I started the project at 5 o'clock at night and just wanted to finish it that night. Well, I did finish all the painting and sealing, but saved the reupholstering until the next day. I kept the original fabric to use as a pattern. I simply split the backside of the feed sack down the middle and stitched that to both sides of the front of the feed sack so it was wide enough. Then I pinned to old fabric to the backside of the feed sack, making sure the printing was going in the correct direction and cut around the old fabric. I left about a 1/2 in border just to make sure I had room to staple. Yes, I left the original stains that were on the sack. I felt like it added character! In August 2010, The Pauper's Castle set up shop for the first time. Oh my how things have changed. This is how our space looked on opening day! The walls were a bit naked. It's funny, when we were getting things ready to step up, it seemed like we had so much. Once it was all spread out, that proved otherwise. So here we are, August 2012, celebrating our 2nd Anniversary! I can't believe it's been 2 years! Time does fly! We have grown dramatically in that short amount of time and continue to grow. In March of this year we were blessed to join The CeCe Caldwell's family as an exclusive retailer for the state of Indiana. It has been an amazing journey as well as a learning experience. Just last month we launched an online shop for CeCe Caldwell's Paint, finishes and supplies. This was a definite missing piece to our business. Launching the online portion has allowed us to share these wonderful paints with the entire state and then some. Last week Todd and I traveled to Michigan for a retailers meeting and training. Here we were blessed to meet our distributors and other retailers in person. It's nice to finally put a face with a name. But the highlight to the day was meeting "THE" CeCe Caldwell! What an honor! Don't tell her I posted this picture, she said she hates her photo taken. She is an amazing person with an amazing paint and a very down to earth approach to business! Just the way we like it! Simple, yet fun! We learned lots of new techniques and I can't wait to share them! If things continue as planned we will be able to provide CeCe Caldwell's - Paint Made Easy - Workshops in the very near future. Here we will be able to share some of these new techniques. We hope to have these classes available as early as late September or the first part of October! I can't tell you how excited I am about this! So tell your friends and family, gather them up and plan to join us for fun evening of painting. Updates can be found on our events page of our website. Wait! Did I say evening of painting? I did...there have been a couple of changes! Good changes. We hope to have the option of offering a 6-9pm class on a Thursday or Friday as well a possibly some daytime classes. So if you have taken our workshop survey, please go back and vote again. I have added the evening time as well and would love to hear your thoughts. This will help us in planning and make sure we offer what YOU would like to see! Main Street Shoppes is also having their annual Labor Day Sale, September 1-9, 2012. There will be mall wide discounts from 10-50% off for all mall vendors. The Pauper's Castle will be offering 10% off all items (excludes paint) in our shop! Just in case, we are shop #33. Thanks for your support over the past 2 years. We would not be here without you, our customer! We greatly appreciate your support and look forward to all the new things our journey has to offer!